Gordy Mccarroll scored four as Kyleakin recorded a comfortable win against GA United. 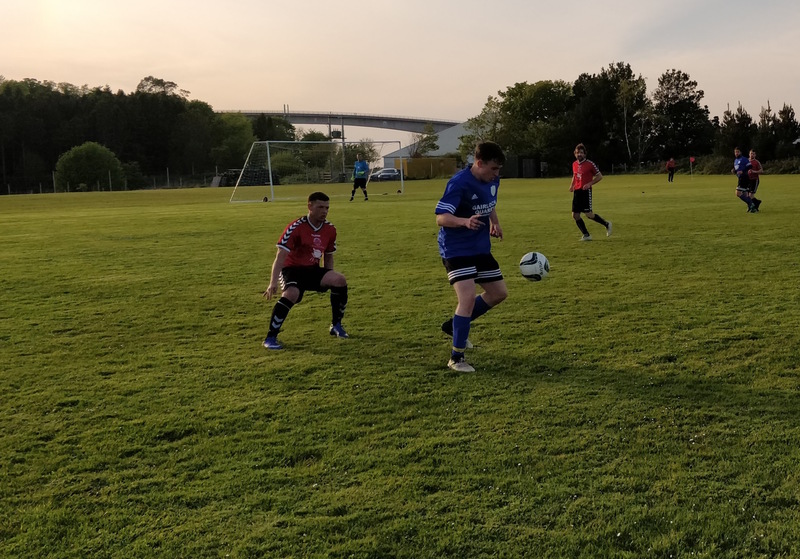 The reigning champions were 5-0 up at half-time courtesy of some fine finishing by Mccarroll – who scored a hat-trick during the first period – and Innis Thompson and David Falconer, who grabbed a goal apiece. Iain Maciver hit the post for GA United with a glancing header in the first half with what was their best opportunity. Mccarroll was denied from the penalty spot with twenty minutes to go but went on to score his fourth and Kyleakin’s sixth shortly before the full-time whistle to move his side ahead of Sleat and Strath on goal difference, albeit DL MacKinnon’s side have played one game fewer. Kyleakin came into the match on the back of a win in the Highland Amateur Cup but, with a heavy defeat away to Juniors and a goalless draw at home to Sleat and Strath had picked up just one point from their previous two league games. 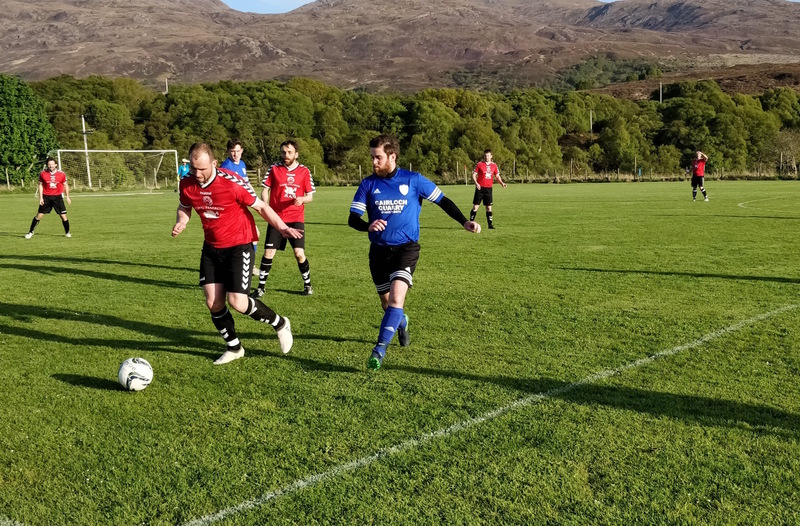 GA United, meanwhile, were searching for their first league win of the season having lost their previous three encounters in a what was a difficult run of fixtures against Sleat and Strath, Juniors, and Mallaig, respectively. 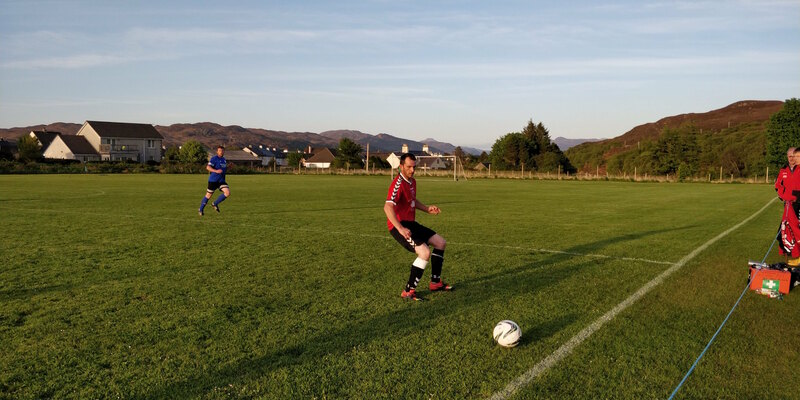 They had also endured a heavy loss to holders Avoch, in the Highland Amateur Cup last Saturday (May 12th). 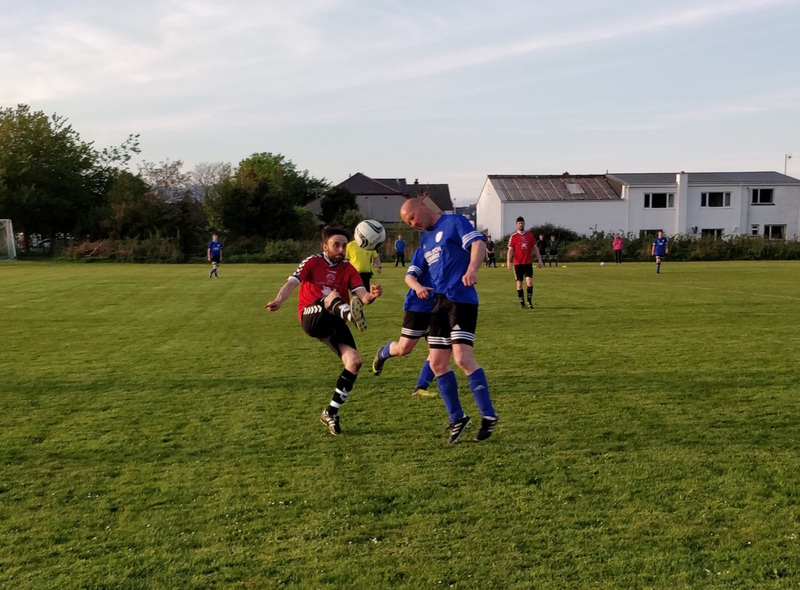 David Butcher’s side prevailed by virtue of a penalty shoot-out in their previous match against Hill Rovers but looked far from tired as they broke the deadlock within a minute of the kick-off. 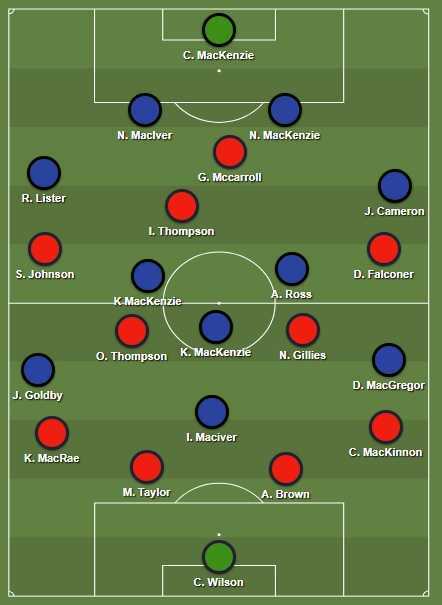 The front pairing of Innis Thompson and Gordy Mccarroll combined to great effect, as Mccarroll found Thompson with a through ball, from which the speedy forward confidently rounded the United goalkeeper Callum MacKenzie before tucking the ball into the empty net. 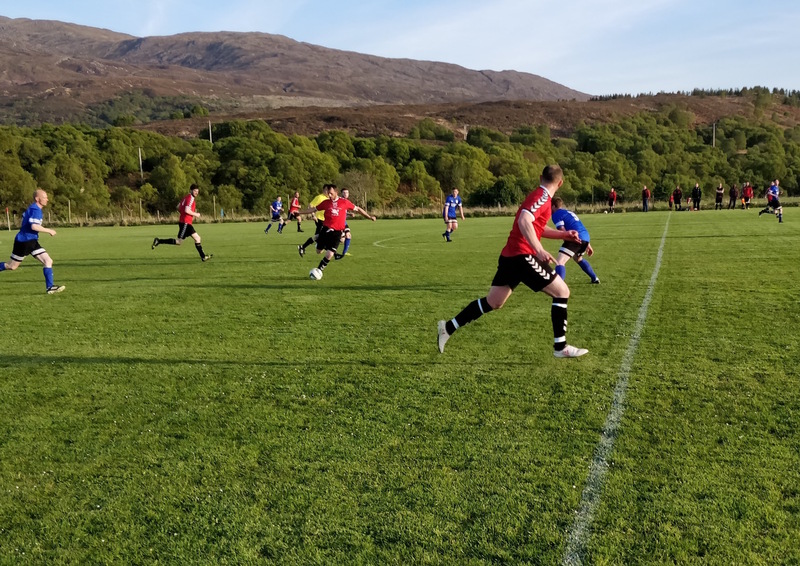 Despite conceding such an early goal, the Wester Ross side pressed forward as though unscathed by the setback – as they looked to find a quick-fire equaliser. David MacGregor’s desire to drive at the Kyleakin defence down their left-side commanded the close attention of Craig MacKinnon and Ali Brown, but unfortunately for the GA midfielder, the experienced defenders were steadfast in protecting Craig Wilson’s goal. A decent spell for United then culminated in Iain Maciver trying his luck with an overhead kick after Joel Goldby and Kenneth MacKenzie combined well, but his attempt lacked both the power and direction to test Wilson. With a quarter of an hour played, the home team reasserted control of the game with a second goal that owed as much to Keith MacRae’s persistence as it did to Mccarroll’s finishing. Unrelenting in his determination to win the ball, MacRae dispossessed the opposition and charged forward before picking out Mccarroll, who with his back to goal, swivelled away from the United defence and calmly placed the ball past MacKenzie to make it 2-0. David Falconer, the scorer of Kyleakin’s fourth goal, makes a run as Gordy Mccarroll looks to release him. Kyelakin added to their lead just a minute later as GA were exposed on the break. Neil MacKenzie saw his ambitious attempt at goal blocked which inadvertently set the hosts upfield though Innis Thompson. Thompson then returned the favour for Mccarroll – following the target man’s earlier assist – with a deft ball over the visitors’ defence which Mccarroll took down on his chest and then lifted over the outrushing MacKenzie, who was left helpless as the ball nestled into the net for the third. While the visitors toiled in vain to unlock the Kyelakin defence, midfielder Joel Goldby caught the eye with an energetic and fearless display on the right-side for United. The youngster’s pace in the wide areas and boldness in challenging for possession presented MacRae – his formidable opposite number – with a few problems as he led the charge for his side. MacGregor, too, on the left wing, also put in a good shift for his side, indeed, he was to be at the heart of United’s best move and their only clear-cut chance of the half. Andrew Ross played in MacGregor down the left wing, and after making space for a cross, MacGregor picked out Maciver who angled a clever glancing header towards the back post but was denied by the upright allowing Kyleakin to clear the ball. David MacGregor, who was one of the bright lights for GA United, controls the ball under the careful watch of Craig MacKinnon. United’s lack of fortune but moreover cutting edge in front of goal was in stark contrast to the efficiency and ruthlessness of the home side who were to score their fourth, five minutes before half-time. Oliver Thompson drifted in from the left to find Innis Thompson, who held the ball up to make space for David Falconer on the right-hand side, once played in by his teammate, Falconer showed no hesitation in unleashing a low drive into the bottom-right hand corner of the goal to put the contest to bed. Although half-time was fast approaching, there was still time for Kyleakin to score a fifth as Mccarroll completed his hat-trick. A mistake in the United defence allowed the hitman to pick his spot, which he duly did with a low drive beyond MacKenzie to make it 5-0. The second period started in a similar vein to the first with Kyleakin imposing themselves on their opponents from the beginning. Norman ‘Raasay’ Gillies wasn’t far away from scoring his team’s sixth just two minutes after the restart with a well-struck effort. The midfielder’s attempt looked net-bound but MacKenzie pulled off a smart save to thwart the home team. Oliver Thompson battles with James Cameron for possession. At the other end, MacGregor found MacIver down the left-side, but the striker opted to shot from a tight angle and directed his shot well wide of Wilson’s goal. Kenneth MacKenzie became the first player to be booked as the match descended into a somewhat scrappy encounter. MacKenzie received a yellow for a late challenge on Innis Thompson near the half-way line and there were calls for him to be shown a second yellow and a red shortly after as Kyleakin appealed for deliberate handball against the player. With 20 minutes to go, Mccarroll was denied from the penalty spot by MacKenzie in the visitors’ goal, who made a good save low to his right. However, the striker made amends with around five minutes left of the game with a confident finish for his fourth and Kyleakin’s sixth. Innis Thompson picked up a late booking after seeking retribution in the form of a rash tackle against Kenneth MacKenzie, who appeared to have fouled the Kyleakin player moments before. However, it didn’t sour what was a clinical performance and a good result for the home team. Four goals, who could ask for more? Well, five, I guess. Only kidding Gordy! The forward’s cool and clinical finishing helped his side win at a canter in the end. Ali Brown was also excellent at the back for Kyleakin, with an assured display. Match report by Adam Gordon.